Located at 3438 Yonge Street (between York Mills Rd. 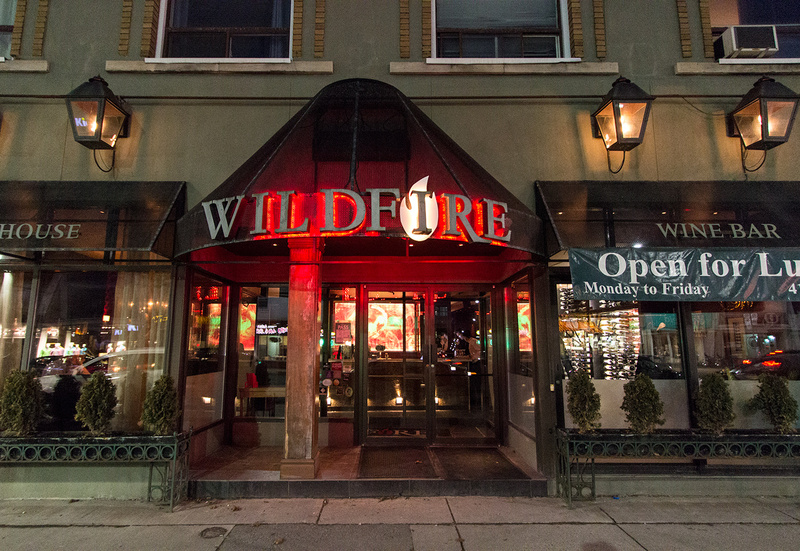 and Lawrence Avenue) Wildfire Stakehouse and Wine Bar has a passion for great food, an expansive wine list, and good service. Their dishes are prepared using fresh ingredients. 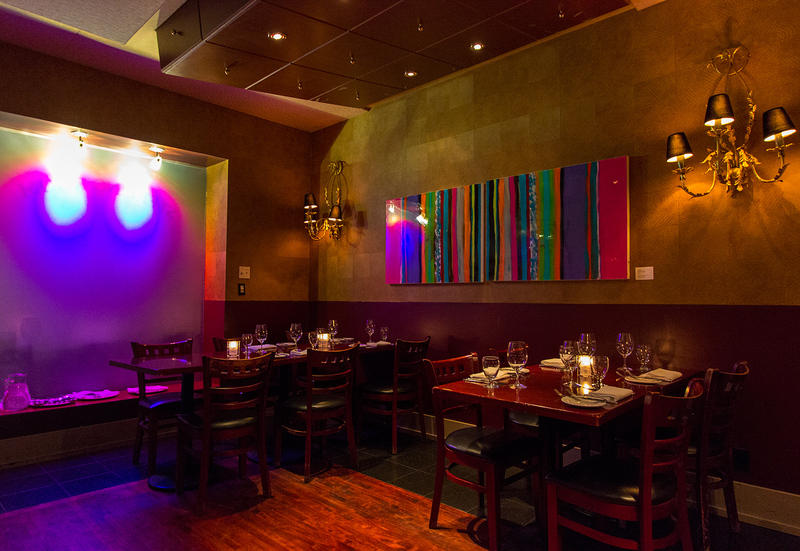 The ambiance is casual to fine dining with great decor all around including cherry-red wood furniture with intricate detailing, modern light fixtures, crystal chandeliers, and original art work on every wall. The moment we arrived we were quickly welcomed in and taken to our table. Our waiter quickly brought us a basket of warm bread with olive oil and kept coming back frequently to check on us. In-house sommeliers stood ready to suggest the perfect pairing from a list of 6,000 bottles and single-serving barrels containing 900 kinds of wine. The first course was an appetizer platter to share amongst the table. 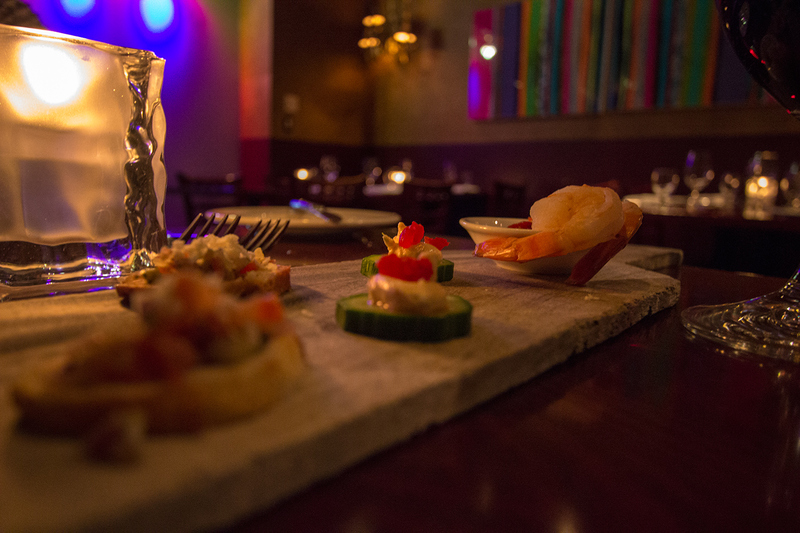 Served on a wooden cutting board it consisted of shrimp cocktail, bruschetta and cucumbers topped with smoked salmon mousse. For starters I ordered the P.E.I. 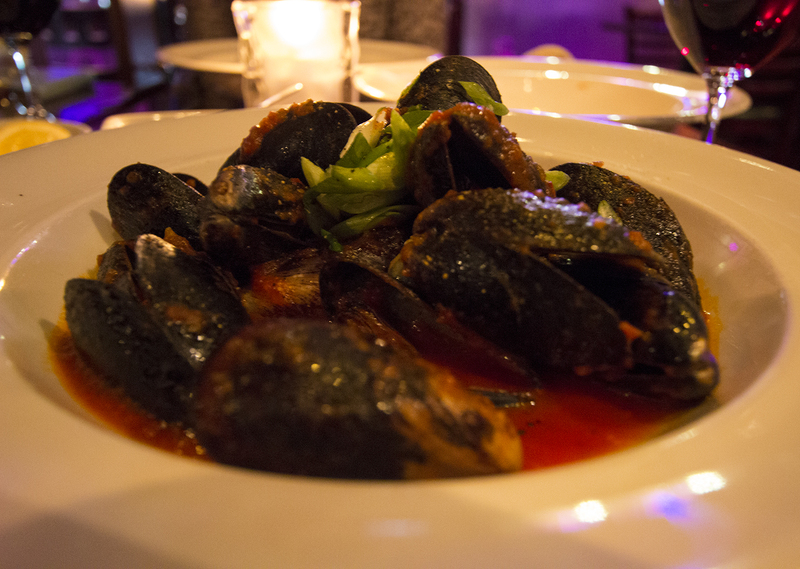 mussels on a spicy tomato sauce. I loved everything about this dish. The mussels were rope grown blue mussels from PEI which are actually harvested all year round. The sauce was exquisite. I used the shells as mini tongs to eat the mussels with, and once finished I mopped up the juices with warm bread. 10 oz. New York Striploin with mashed potatoes, grilled zucchini, red peppers, and baby carrots. A substantial cut for the hearty appetite of those who really like to sink their teeth into a great piece of meat. 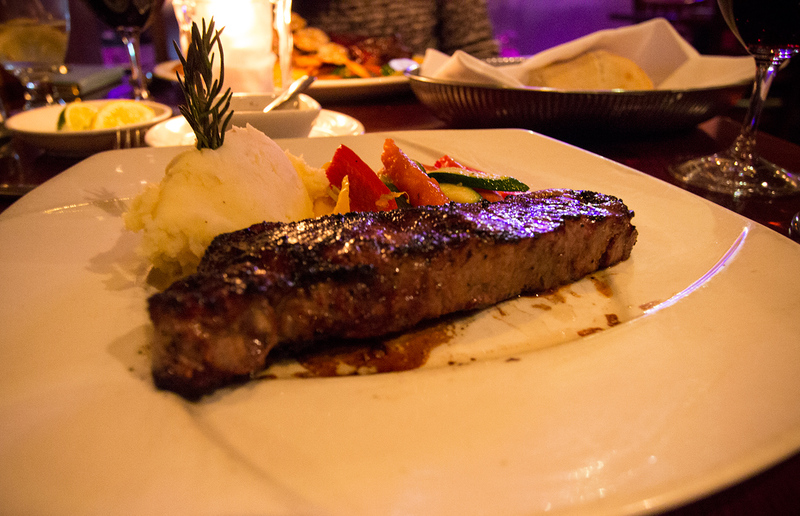 My steak was cooked medium-well and was full of flavour and with a tantalizing aroma. Baby back ribs with grilled shrimp on a bamboo skewer. 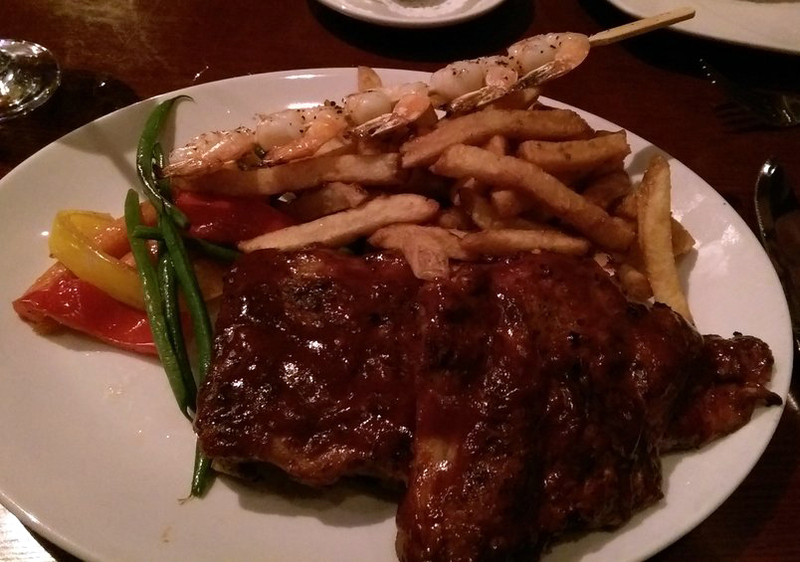 While the ribs were tender and fall-off-the-bone the sauce did not have an authentic taste. The shrimps tasted fresh and were perfectly grilled. 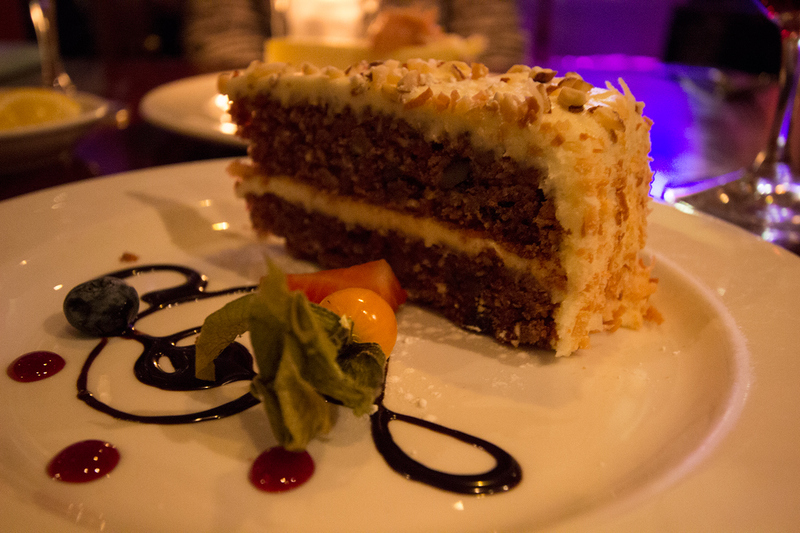 Moist carrot cake with walnuts, and cream cheese frosting. Loved this! I also liked the fancy plate decor. A musical note drawn with chocolate syrup, and accented with an inca berry, a blueberry, and a strawberry. A rich New York cheesecake served with fresh chef selected toppings. 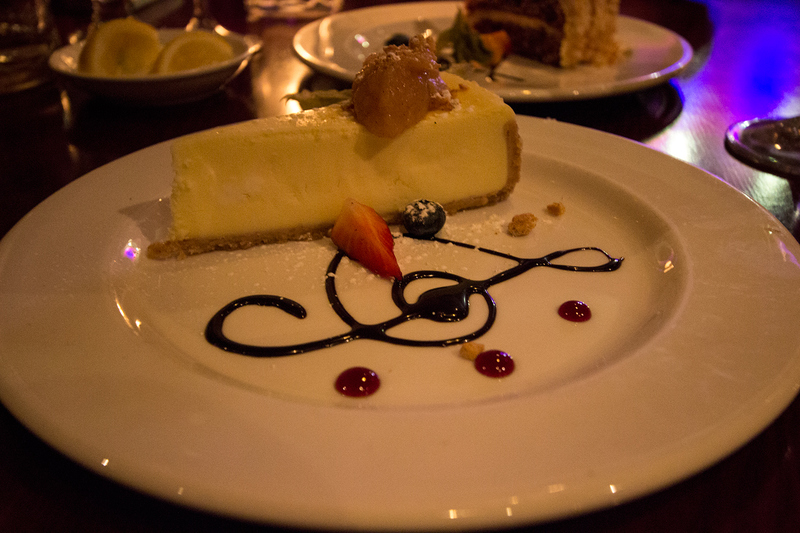 The cheesecake was fantastic, rich, tart, and refreshing. I have been to Wildfire Steakhouse and Wine Bar three times and overall I am very pleased with it. Everything from ambiance and staff to the food and drinks were great! We’d suggest this place to everyone to try. Wildfire Stakehouse is a good choice for a romantic evening, family celebration, or a friendly get-together. For reservations and more information visit the WildFire Stakehouse & Wine Bar website. The ambiance of this restaurant is very welcoming. One thing I’d liked to add is that the art displayed on the walls is for sale, so if you fall in love with a piece you have the option of purchasing it and taking it home.